Richard Foster, bestselling author of 'Celebration of Discipline' and founder of Renovare, writes these words as one who has experienced true worship. This new book gently guides you along the path of meditative prayer, so that you too can know a deeper fellowship with God. Weaving together quotes and stories from the lives of mothers and fathers of the faith as well as powerful encounters with God from his own life, Foster describes the riches of quieting your mind and heart in order to listen to and obey God more closely. Along the way, at his clearest, most practical best, he also provides the biblical teaching and step-by-step help you need to begin this prayer practice for yourself. 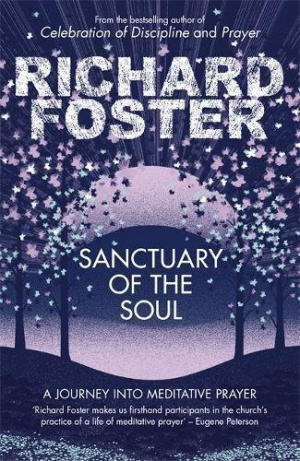 Sanctuary of the Soul by Foster, Richard was published by Hodder & Stoughton in August 2012 and is our 5214th best seller. The ISBN for Sanctuary of the Soul is 9781444702583. A lovely gentle book that takes us into the mystery and understanding of meditative, or as some may call it contemplative, prayer in Richard Foster's inimitable and considered way. There is to this book a cadence that matches the subject being considered and taught. A considered and slow rhythm gently leads you into the Biblical and theological consideration of meditation and reflective prayer, and from there through stories of others who have journeyed into the heart of meditative prayer, be they early church people or our modern contemparies or even Foster himself. We are led into a guide of how to become practitioners of this ancient and important way of praying and knowing ourselves in relationship with God. For some this tempered pace may seem a little too slow, but for those yearning for the stillness to be found in this form of prayer this book will be a wonderful tool and guide. Got a question? No problem! Just click here to ask us about Sanctuary of the Soul.